The science of vibration control is a complicated one, but it is of great significance in the audio business at both ends of the signal chain. The importance of effective microphone shockmounts is fairly widely recognised by both manufacturers and users these days, and while the classic 'cat's cradle' (the design of which dates back over 60 years) is still very common, much more sophisticated designs using advanced materials are now available from the likes of Rycote and Cinela. Sadly, the same level of R&D and the application of modern technology haven't really been applied to the support systems for loudspeakers, and some loudspeaker supports are shockingly poorly designed and inherently inadequate. Whereas the microphone shockmount is designed to prevent vibrations reaching the capsule, the speaker mount has to prevent vibrations leaving the cabinet — but the same basic principles and techniques apply in concept. Ardán Audio (the unusual name is Gaelic for 'platform' or 'stage', and is pronounced 'Ar-dawn') are a new Irish company founded by Brent Finlayson Smith and John Gallen, and they focus on the design and manufacture of what they term "Audio Elevation Enhancement products.” The company's first product, the EVP M1 reviewed here, was launched at NAMM at the start of this year after two years in development, and is intended to support small to medium-sized speakers, either from the floor, or on a desk or console meterbridge. The EVP M1s arrived double-boxed, and unpacking the stands felt like a pass-the-parcel game in a cardboard factory! However, those trees didn't die in vain: the stand components are heavy and delicate, and the packaging ensures that they arrive in the same condition they left the factory. The overall 'international shipping box' comprises two more inner boxes, each containing one complete stand in four separate pieces. These are the Isobase, the Elevation Pro stand, and two vertical support rods. The EVP M1 is designed to support a maximum weight of 20kg (44lbs) in an upright position, with maximum speaker dimensions of 390 x 292 x 332mm or 15.3 x 11.5 x 13 inches (HxWxD). The smallest base width that can be accommodated is 135mm (5.3 inches). While it is possible, in most cases, to mount a speaker horizontally, there are some practical limitations that are explained in the brief but excellent manual. 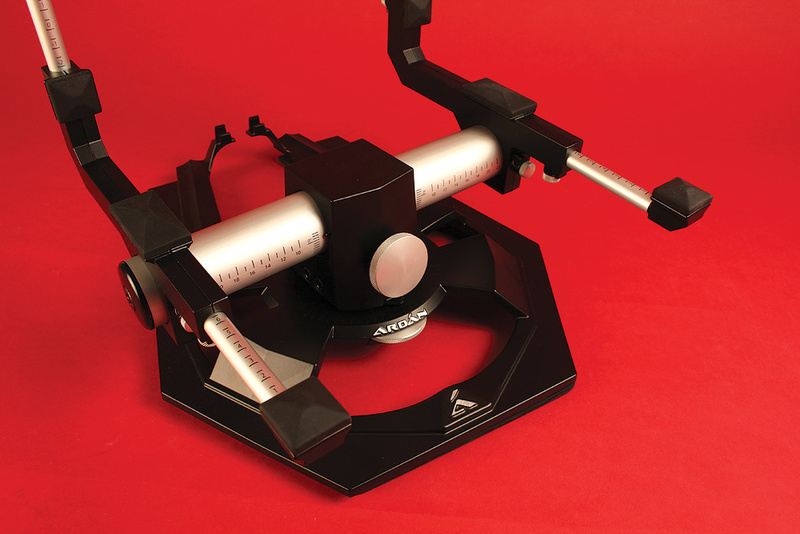 Assembling each stand from its four components is perfectly intuitive, but the manual provides guidance and recommendations on how to optimise their setup and use. Essentially, the synthetic styrene-butadiene rubber (SBR) IsoBase is placed on the mounting surface (floor, table or meter bridge), and then the cast-alloy Elevation Pro stand sits on top, located by four rounded studs in the base slipping into receptacles in the IsoBase. The two vertical support rods are then installed into the rear part of the upper Elevation Pro frame. A pair of silica-filled fabric 'pipes' located in channels in the IsoBase run in a U-shape from the rear, around the front and back to the rear on the other side. These help to damp the interface between the cast-alloy base of the Elevation Pro stand and the heavy rubber IsoBase platform. The base casting is of very high quality and is apparently made in Italy. In fact, the whole Elevation Pro stand is beautifully made, and it is clear to see why it costs what it does. Ardán Audio have filed patents on the design with 28 separate claims. A central, rotating column pivots in the centre of the cast base, and a pointer at the front traverses an embossed scale on the base covering ±40 degrees from the centre position. A side-on, knurled thumbwheel below the column clamps the rotation at the desired angle. Passing horizontally through this central column is the main aluminium support tube. This has printed scales on each side, which sit alongside pointers emerging from both sides of the central column. The scale shows the angle of tilt in five-degree increments, ranging from 36 degrees back to 15 degrees forward. Adjustment is via a large knurled knob on the front of the column, which rotates the shaft through a fine gearing mechanism, to ensure that small adjustments can be made easily, even when a heavy speaker is in situ. Two hollow, L-shaped speaker support arms are mounted on the outside edges of the horizontal tube, and can be moved independently in and out to accommodate a wide range of speaker widths. Again, the horizontal tube has printed scales (with 5mm increments) on either side, to ensure that the two arms are set symmetrically about the centre axis, and thumbscrews secure the arms in place. Mounted on each of these support arms, directly above the horizontal support tube and at the bottom of the upright arms, are large, synthetic styrene-butadiene rubber (SBR) cushions to hold the speaker in place, all shaped to provide the minimum contact area, and maximum vibration isolation. These fixed cushions are supplemented by two more adjustable rubber cushions on each side, mounted on D-shaped, solid aluminium support rods that extend horizontally from the front, and vertically at the back. The two front extension rods slide in and out of the support arms, secured by more thumbscrews that tighten onto the flat under-surface of the rods. Again, a printed scale with 5mm increments is provided for accurate alignment. The rear rods are fixed into the short side of the support arm by more thumbscrews, and for these the rubber pads are mounted on movable frames that are free to slide up and down as necessary, fixed in place against more scale markings with yet more thumbscrews. Every user-adjustable part of the EVP M1 is marked, for precise and repeatable setting up. The whole thing is engineered very nicely indeed, and feels very solid and reliable. Surprisingly little tension is required on the thumbscrews to lock everything securely in place, nothing rings or rattles, and the rubber pads provide a very effective level of isolation and stability. The manual recommends adjusting the arms to place the rubber cushions on the outside front edges of the speaker's base, and about halfway up at the speaker's back panel. There is enough range of movement here to avoid heatsinks and connector or control panels in the vast majority of cases. The bottom of the speaker baffle ends up about 130mm above the underlying support surface, which is a lot more than most of the foam-based isolation pads currently on the market, although this is unlikely to be a problem in most practical applications. Configuring the front and rear support arms to the correct width and positioning takes a little time, but it's not difficult, and once the optimum settings for the first speaker are arrived at, the second stand can be set much quicker by adjusting everything to the same scale markings. 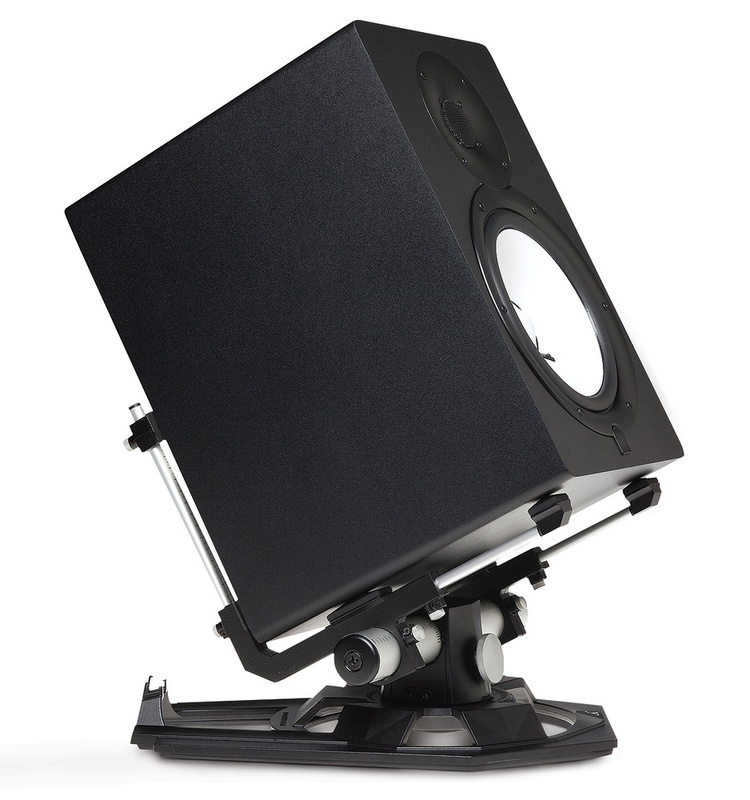 With the speaker supports positioned appropriately, the speaker can be placed on the stand, and then the vertical tilt and toe-in angles adjusted as appropriate. One very neat touch is a pair of cable-management guides at the rear of the cast base-plate, which can be used to ensure that the mains power cable (if using powered monitors) crosses the audio input cable at precisely 90 degrees, for minimal interference. I tested the stands with both my diminutive PMC DB1S and the larger (and much deeper) TB2 SA II monitors. Although the latter are deeper than the EVP M1s' specifications cater for, I found that they were perfectly stable because the amplifier on the rear panel brought the centre of gravity sufficiently behind the front baffle — although I wouldn't want to try angling the speaker down! The speaker only rests on the rubber mounts, and while these provide a high degree of friction, the speaker is not fixed to the stand in any way. Ardán say that they have found the system to be quite robust when used in a tilt-down mode, but clearly some caution is required, and perhaps meter-bridge mounting, where a tilt-down angle is more likely to be required, isn't the EVP M1's real forté! Another practical issue is that the base casting extends a long way at the rear, so the EVP M1s require a deep platform to sit on. This could be a struggle even on large console meter-bridges, but on a desktop — as I mainly used them — this large front-back depth has the advantage of ensuring that the speaker baffles end up well forward of the computer screens, which is essential for good imaging. The ability to adjust the speaker tilt and pan angles with a high level of precision makes it very easy to experiment and find the optimum settings for a given speaker and listening position, and there is no doubt that the system provides extremely effective vibration isolation, allowing the speaker to do what it does properly, without channelling energy through the support to the desk. In this respect, the stands seemed to perform every bit as well as the Primacoustic RX5 UF mounts I usually use, but with far greater flexibility and configurability. On first seeing the EVP M1, the initial impression is of a well-engineered, if not over-engineered, speaker support, and the practice bears this out. It is superbly designed to make it extremely adjustable, but in a very simple, elegant and reliable way. It can be configured to accommodate a wide range of small and medium-sized monitors, and when set up correctly it is extremely effective in holding the speaker securely, and eliminating virtually all vibration travelling through the base into the supporting structure. As something of an engineering geek, the sheer elegance and mechanical construction of the EVP M1 appeals to me enormously. For those customers who require a tall stand to raise the speakers up behind a console or desk, the good news is that Ardán Audio are busy working on a variety of other, related products, including some height-adjustable floor 'pylons' designed to accept the EVP M1 mount on the top. These should be on the market in a few months. Now that would make for a hugely attractive and immensely versatile system, and I can't wait to try it out. Among the other 22 products that Ardán Audio are currently working on is a motorised version of the EVP M1, and a lower-cost, less adjustable version. Clearly, this is going to be an interesting company to watch in the months and years to come. Highly configurable for different speaker sizes. Precision adjustment of pan and tilt angles. Immaculate construction — both in the design and the build. No physical attachment between speaker and stand makes tilt-down applications slightly perturbing. A very elegant and immaculately constructed loudspeaker support system that provides a very high degree of vibration isolation, while also allowing precision adjustment of the speaker's tilt and pan angles. The support arms are fully configurable to accommodate a wide range of speaker sizes and weights. Ardán Audio +353 1902 2881.